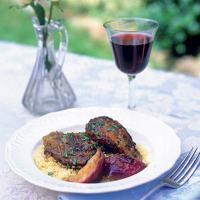 Delicately spiced Moroccan tagines are often enhanced by the sweetness of fresh or dried fruit. In this one, fresh peaches given a hint of smokiness from the grill or griddle bring out the full, rounded flavour of guinea fowl. Serve it with couscous or as we did, with bulgar wheat. Rub the spices into the pieces of guinea fowl and set aside for one hour, or longer. Heat 1 tbsp oil in a wide, deep frying pan and brown the guinea fowl pieces. Reduce the heat, add the onion and 1 tbsp honey, salt and pepper and 500ml water. Bring up to the boil, then reduce heat and simmer for about 25–30 minutes, until the guinea fowl is just cooked through and the liquid is reduced by half. Meanwhile, line a baking sheet with foil and preheat the grill or heat a griddle pan until extremely hot. Mix the remaining oil and honey and turn the nectarine pieces in this to coat evenly. Grill (or griddle) the nectarine pieces close to the heat until they are streaked with brown on both sides. When the guinea fowl is ready, add the orange flower water, any juices left from the nectarines, and the nectarine pieces. Cook for a minute or so longer, to heat through and impart some of the fruitiness to the sauce. Adjust the seasoning. Sprinkle with parsley and serve immediately. The pungent spices and the sweet and bitter flavours require a voluptuous red wine with very soft tannins. A New World Pinot Noir will do the trick nicely, flattering the dish with even more fruit.